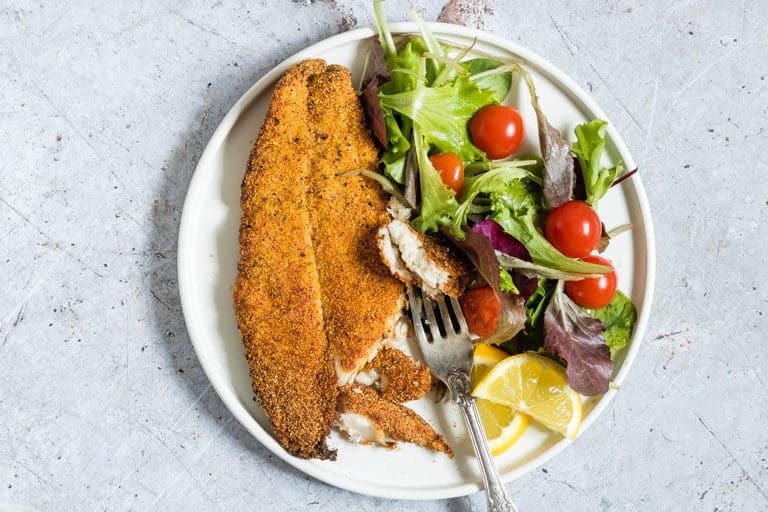 With this recipe for Crispy Golden Air Fryer Fish, you can indulge in a healthier version of super delectable, crunchy fish fillets without the guilt! Suitable for Gluten Free and Low Carb diets. Post includes Weight Watchers points. As a self-proclaimed foodie, I am a pretty adventurous home cook. I am always willing to try anything at least once, and there are not many things I hesitate to whip up in my kitchen. But frying up fish is one of those items. The task is filled with so much uncertainty and: how do I know when the fillets are fully cooked through? And then there is the balancing act of making sure the fillets turn out crisp on the outside without getting soggy from absorbing too much oil. It seemed to me that frying fish fillets was something best left to the experts at our local pub. But peeps, I am happy to report that this recipe for Crispy Golden Air Fryer Fish has changed all that. Yeap. Why Make Fish in the Air Fryer? As you know I am a huuuuuuge fan of the air fryer. It allows me to cook up healthier versions of all my favourite fried foods, which means I can indulge my cravings guilt-free. How is this possible? By circulating heat all around the food, air fryers allow you to ‘fry’ foods using the smallest amount of oil. Folks, the air fryer really does make it soooooo easy to make fish fillets that are perfectly crunchy on the outside and light and delightfully light and flaky on the inside. 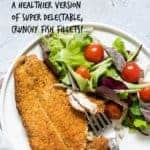 And this Crispy Golden Air Fryer Cajun Fish recipe is quick and simple. 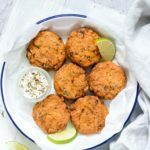 Just toss the fillets with the flavourful Cajun mixture, pop them in the air fryer, and in just a handful of minutes they are ready to serve. Ready to learn just how easy it is to make this Crispy Golden Air Fryer Fish? Then gather up your ingredients and I will show you…. Preheat air fryer to 400F (200C). Mix the first 5 ingredients together and then add to a Ziploc bag. Rinse the catfish, pat dry and add fillets to the Ziploc bag. Seal the bag and then shake until the fillets are fully coated. Place the coated filets in the air fryer basket. (if you have a small fryer you will need to cook them one at a time). Spray the fillets with low calorie spray, close the air fryer and cook for 10 mins. Turn the fillets over and cook for an additional 3-4 mins, or until done. I find that fresh fish fillets give the best results in this recipe. Don’t let the fish sit in the coating mix or it will get soggy. Coat the fillets and then immediately place in the air fryer to cook. Feel free to customize the flavour by using your favourite spices, herbs and seasonings. Chef’s Tip: Since air fryer temperatures can vary depending on the make and model, this recipe includes a range of suggested cook times. I recommend starting with less time, checking for doneness, and then adding more time as needed. Cornmeal or breadcrumbs give really good results aka crispy fish fillets. One way to bread the fish fillets is to lightly coat it with low calories cooking spray or olive oil before coating it in your bread crumbs. This is the way I prefer. Alternatively, you can dip it in egg before coating it with the breadcrumbs. This changes the flavour very slightly, but not enough to make a big deal out of it. Try both ways and see which you prefer. Also, make sure you let the excess egg drop of the fillets and it is as dry as possible before coating in the breadcrumb. 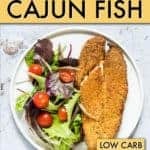 How To Make Sure Your Air Fryer Cajun Fish Is Crispy? Getting the breading right can be the difference between crispy and soggy fish fillet. Don’t let the fish sit in the coating mix or it will get soggy. Coat the fillets and then immediately place in the air fryer to cook. Also, you want to use a very light olive oil spray or a brush a small amount of olive oil on the fish fillets before dipping. I really do mean light as if it is swimming in oil you will end up with a soggy coating (and loose the benefit of the air fryer aka cooking with minimal oil. Can You Air Fry Fish Without Breading? One question I have been asked if you can air fry fish without breading? And the answer is yes you can. Simply season with herbs and spices to your taste and fry as normal. 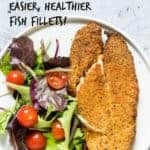 How Long to Cook Fish in Air Fryer? Cooking times depending on the thickness of the fillets. This recipe took 13 mins. When cooking Fish fillets in the Air Fryer for the first time, I recommend aiming for 13 mins per side and then checking for doneness. You can then increase or decrese the cook time according to your results. You can certainly cook Air Fryer Fish from frozen. handy for those days when you dont have time to take out the fillets from the freezer before hand. I happen to loooooove the flavours in Cajun seasoning mix, which is perfect for those upcoming Mardi Gras celebrations. 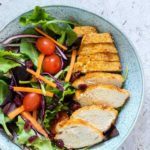 And for even more zesty flavour, try a combination of creole seasoning with a little cayenne pepper or red chilli flakes to really kick things up a notch. You can also feel free to mix things up a bit and swap the Cajun seasoning for Old Bay seasoning. There are also some fantastic pre-packaged fish fry rubs available that would work quite well. You can also use Tilapia fillets instead of catfish in this recipe. Use the fish that you prefer for this. To make air fryer fish tacos, simply cook the fish as normal in the air fryer and then slice it up, add to your taco along with shredded veggies, sour cream etc. The simplest way to make Air Fryer Fish and Chips, is to first fry the chips, and whilst the chips are frying get the fish seasoning ready. When the chips are done, remove them, coat the fish and then fry. There is just 1 Freestyle Point in a serving of Crispy Golden Air Fryer Fish. Here are a few suggestions of what to serve with this recipe. 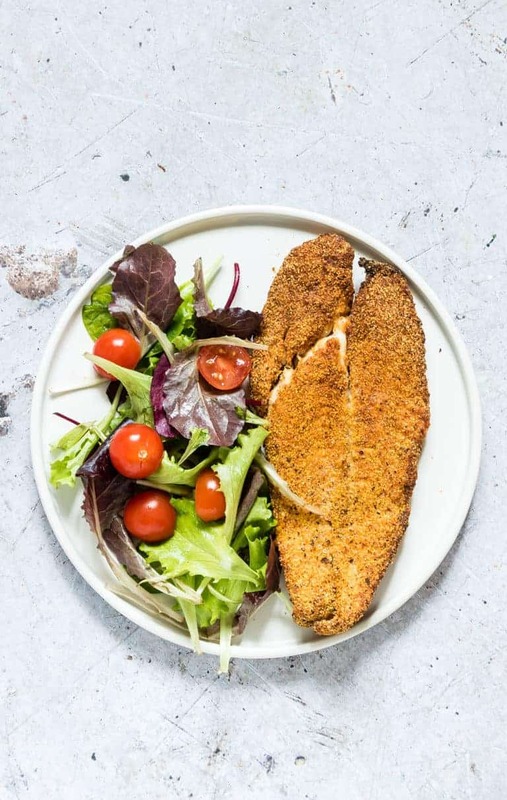 Crispy Air Fryer Chicken Breast. Mexican Air Fryer Corn on the Cob. 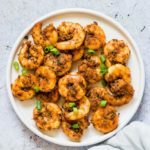 Cilantro Lime Air Fryer Shrimp Skewers. 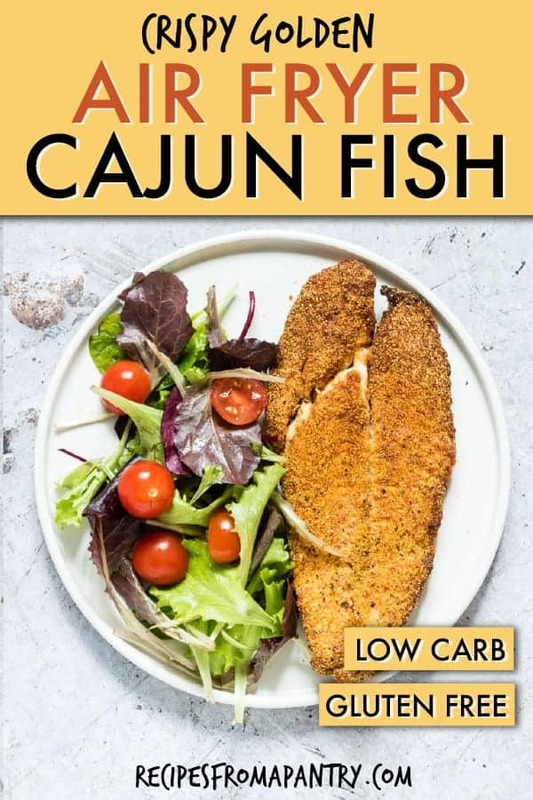 Thank you for reading my Air Fryer Cajun Fish recipe post. And please come visit again as I continue dreaming up recipes, traditional African recipes, African fusion recipes, Sierra Leone recipes, travel plans and much more for you. Thanks for supporting Recipes from a Pantry, UK food blog. Don't forget to tag #recipesfromapantry on Instagram or Twitter if you try Crispy Golden Air Fryer Fish! It is really, really awesome for me when you make one of my recipes and I'd love to see it. You can also share it on my Facebook page. Please pin this recipe to Pinterest too! Thank you for reading Recipes from a Pantry. Crispy Golden Air Fryer Fish is perfectly crunchy on the outside and light and flaky on the inside. Place the coated fillets in the air fryer basket. (if you have a small fryer you will need to cook them one at a time). You can also use Tilapia fillets instead of catfish in this recipe. i absolutely love fried fish, but like you i don’t like to cook it either. mostly because of the smell, i feel like i can never get that grease smell out of the air. i love this recipe in the air fryer. one of these day im going to have to make the plunge and buy one! This air fryer fish sounds amazing. I would definitely be trying this fish. But I need to get my air fryer ASAP. I see lots of recipe to try on your blog. Looks so crispy! I wonder, would this work with catfish, too? I can’t wait to get an air fryer and I’m going to need lots of help learning how to use it. This would make the best weeknight fish tacos. 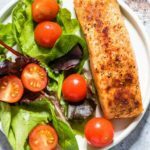 I need new ways to prepare fish so my kids will eat it!